If you love the beach, then you will love these simple DIY beach Christmas ornaments! Seriously, they could not be any more simple. Plus, they are a great way to show off your favorite vacation spots throughout the years. Bring home a little sand from each trip and create a meaningful ornament collection! The base of the ornament is just a clear fillable ball ornament, available at most craft stores during the holiday season. You can buy them in glass or plastic. Glass is really nice, but plastic might be more realistic if you have pets or small kids. Or a clumsy family member! I think that the simplicity of these ornaments makes them really stunning. They have the potential to blend in or really be a show stopper if you have otherwise neutral ornaments. You can’t go wrong! If you are going to go to the trouble to make these ornaments, I suggest making at least 6. It’s one of those things that as long as you are making it, you might as well make a few at once. A whole set sprinkled throughout the tree really makes a gorgeous effect! If you are looking for a fun and beautiful Christmas craft, look no further than these beach sand ornaments. Use a small funnel (this one came with a flask!) 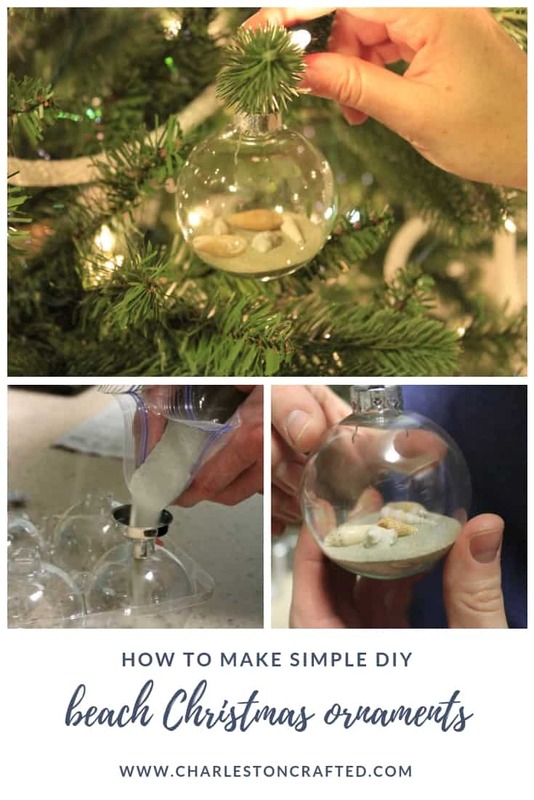 to pour sand into the ornament. You want it to be about 1/3 full. Drop in a few small sea shells. Re-attach the topper. Add a ribbon or hook and hang on the tree! What’s going on your tree this year?